Geologists divide the history of the Earth into eons and eras. That’s so they don’t have to always be saying “400 million years ago” or whatever. The earliest period was the Hadean Eon. The Hadean Era started when the Earth formed about 4.5 billion years ago. It lasted until about 3.8 billion years ago. The Hadean Eon is when the oldest igneous rocks on Earth formed. Probably nothing was alive on Earth during the Hadean Eon. When the continents began to form, we call that the Archaean Eon. During the Archaean Eon, the earliest living cells probably formed in the oceans. During the Proterozoic Era, between 2.5 billion years ago and 542 million years ago, eukaryotic cells developed. Near the end of the Proterozoic Era, about 600 million years ago, creatures with more than one cell like hydras, jellyfish, and sponges lived in the oceans. Not long after that, beginning about 550 million years ago, these evolved into flatworms, then roundworms, and finally into segmented worms. During the Cambrian period, between 542 and 488 million years ago, moss began to grow on land at the edges of the water. 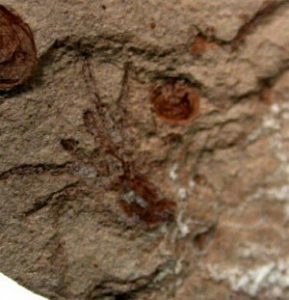 Early arthropods like spiders and millipedes became the first land animals. Thanks to meiosis, or sexual reproduction, many new kinds of plants and animals that lived in the oceans appeared at this time, like octopus and eels. During the Ordovician period, between 488 million years ago and 443 million years ago, mushrooms and fungi joined the moss on land, and also primitive plants. Sea animals started to use calcium to build shells and bones. During the Silurian, from 443 to 416 million years ago, the first fish with jaws developed. Finally during the Devonian period, some fish developed lungs and legs, like frogs, and left the water for the land. On the land, the frogs found bigger plants now, too – mainly ferns. The Carboniferous period (359-290 million years ago) brought the first reptiles that could lay their eggs on land. They didn’t have to go back to the water to have babies. Now you get the first pine trees and ferns with seeds that could also have babies without water. During the Permian period (290-248 million years ago), pine trees covered most of the land on Earth, and reptiles also spread, but the ferns with seeds died out. During the Triassic period dinosaurs began to dominate the land, and then the Jurassic was the high point of the dinosaurs. During the Cretaceous period, flying insects developed, and the first flowering plants that those insects pollinated, and the birds that ate the insects. But at the end of the Cretaceous, about 65 million years ago, most of the dinosaurs became extinct when a huge meteor hit the Earth. Once the dinosaurs were gone, there was plenty of room on Earth for mammals to evolve. In the Tertiary period (95-1.8 million years ago), mammals pretty much took over the land, while some remaining dinosaurs evolved into birds. The spread of grasses about fifty million years ago gave the mammals something to eat. Near the end of the Tertiary period, about two million years ago, the first hominids appeared. Before the end of the Tertiary humans were already using stone tools. The last geological period is the Quaternary, and we’re still in the Quaternary period today. Cite this page: Carr, K.E. Quick summary of geological eras. Quatr.us Study Guides, June 24, 2017. Web. April 19, 2019.